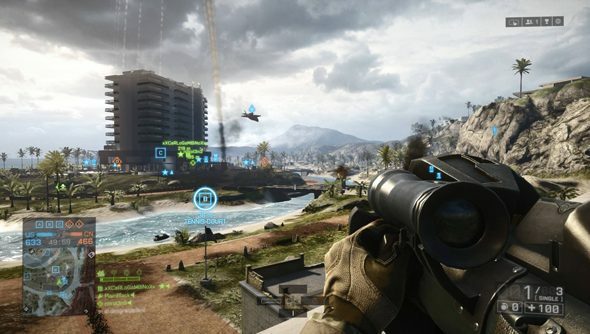 Battlefield 4 may have eventually become one of the top games of 2013, but it’s determined to be more like one from 2011. “Changes have been made to soldier movement so that it closely matches the one in Battlefield 3,” writes DICE community manager Vincent Vukovic. You only need to concern yourself with Battlefield 4’s planned September update if you play on Rush, or Obliteration, or Carrier Assault, or Capture the Flag. Or if you ever fire guns, or move your character. The changes to character movement won’t compromise visual fidelity and should make it easier to exit “undesirable firefights” in a hurry. They’re part of a move to make shootouts a more uniform length. To that end, DICE have balanced a reduction in visual recoil with improved ‘tickrates’ – i.e. the frequency with which the game updates to register movement and damage. That way, presumably, players should have a better chance of responding to incoming attacks in time to put up a fight. A “special effort” has gone into making revives easier to use and understand – and DICE are still working on their netcode to ensure deaths from behind cover become an ugly memory. We’re not privy to everything that’s due in September: we’re told “general improvements and tweaks” are coming to many of the game’s modes, buffs and nerfs are being applied to its vehicles, and that DICE are working to de-clutter the UI to display only what’s important. Battlefield 4 is free this week. What do you think is most important for DICE to concentrate on?